Silex began life in the labs of OHG's R·U·S·S·T Institute with a skeleton of C.A.D./C.A.M system fonts, the tungsten carbide blade of a milling machine for a soul and, in the commercial versions if Silex, a box of OpenType features for brains. Silex Stencil Basic is a solid, hard-edged, ridiculously masculine display face — Suitable for headlines, logos, labelling heavy equipment, the big numbers on the sides of battleships and, if you are a wrestler or mixed martial arts fighter, your résumé. This version of Silex Stencil Basic (2.0) has upgraded with class-based kerning for improved letter spacing across all supported languages. Silex Stencil Basic is a solid, hard-edged, masculine display face — Suitable for headlines, logos, labelling heavy equipment, the big numbers on the sides of battleships and, if you are a wrestler or mixed martial arts fighter, your résumé. Copyright (c) 2012 by Russell McGorman /Our House Graphics. All rights reserved. 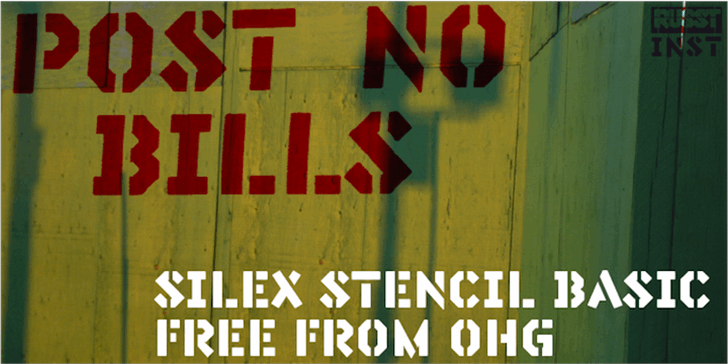 Thank you for downloading Silex Basic.<br><br>Our House Graphics: Basic (Non Commercial) License<br>By downloading this font package, you are agreeing to be bound by the terms of this Agreement. This Agreement, in conjunction with the receipt that accompanies each purchase from Our House Graphics (“OHG”), constitutes the complete agreement between you and OHG.<br>1. Allowed uses: <br>Non-Commerial Use of Free fnts from OHG: You may not redistribute. Yu may use this font ffreely for personal use. It is expected that if you intendt to use this font for commercial purposes you will puchase a commecial license and abide to the terms. Failure to comply will void your license. <br>You may use the licensed font to create images on any surface such as computer screens, paper, web pages, photographs, movie credits, printed material, T-shirts, and other surfaces.<br>2. Number of users: One user on one device per download.<br>3. Third parties<br>Provided it is for a charitable or not for profit application, you may provide the font to a graphic designer, printer or other service bureau that is working on your behalf only if they agree to use the font exclusively for your work, agree to the terms of this license, and retain no copies of the font on completion of the work.<br>You may not provide the font or make it accessible to any other third parties.<br>4. Embedding<br>You may embed the licensed font into any document you send to third parties. Such documents may be viewed and printed (but not edited) by the recipients.<br>You may not under any circumstances embed the licensed font into software or hardware products in which the font will be used by the purchasers of such products. Such use requires a different license which may be offered by the Foundry, OHG or one of their vendors. Please contact font.support@ourhousegraphics.com for further information.<br>5. Modifications<br>You may import characters from the font as graphical objects into a drawing program and modify such graphical objects.<br>You may not modify, adapt, translate, reverse engineer, decompile, disassemble, or create derivative works based on the licensed font itself without Our House Graphics’s prior written consent.<br>6. Copyright<br>The font and the accompanying materials are copyrighted and contain proprietary information and trade secrets belonging to Our House Grpahics and their contributing designers and techincians. Unauthorized copying of the Product even if modified, merged, or included with other software, or of the written materials, is expressly forbidden. You may be held legally responsible for any infringement of the foundry’s intellectual property rights that is caused or encouraged by your failure to abide by the terms of this Agreement.<br>7. Termination<br>This Agreement is effective until terminated. This Agreement will terminate automatically without notice from OHG if you fail to comply with any provision contained herein. Upon termination, you must destroy the written materials, the Product, and all copies of them, in part and in whole, including modified copies, if any.<br>8. Product Upgrades<br>OHG may, from time to time, update the Product. Product upgrade pricing may apply.<br>9. Disclaimer and Limited Warranty<br>OHG warrants the Product to be free from defects in materials and workmanship under normal use for a period of twenty one (21) days from the date of delivery as shown on your receipt. OHG’s entire liability and your exclusive remedy as to a defective product shall be, at OHG’s option, either return of purchase price or replacement of any such product that is returned to OHG with a copy of the invoice. OHG shall have no responsibility to replace the product or refund the purchase price if failure results from accident, abuse or misapplication, or if any product is lost or damaged due to theft, fire, or negligence. Any replacement product will be warranted for twenty one (21) days. This warranty gives you specific legal rights. You may have other rights, which vary from one jurisdiction to another.<br>EXCEPT AS EXPRESSLY PROVIDED ABOVE, THE PRODUCT, IS PROVIDED “AS IS”. NEITHER OHG NOR THEIR VENDOR(S) MAKES ANY WARRANTY OF ANY KIND, EITHER EXPRESSED OR IMPLIED, INCLUDING, BUT NOT LIMITED TO THE IMPLIED WARRANTIES OF MERCHANTABILITY AND FITNESS FOR A PARTICULAR PURPOSE.<br>The entire risk as to the quality and performance of the Product rests upon you. Neither OHG nor their vendor(s) warrants that the functions contained in the Product will meet your requirements or that the operation of the software will be uninterrupted or error free.<br>NEITHER OHG NOR THEIR VENDOR(S) SHALL BE LIABLE FOR ANY DIRECT, INDIRECT, CONSEQUENTIAL, OR INCIDENTAL DAMAGES (INCLUDING DAMAGES FROM LOSS OF BUSINESS PROFITS, BUSINESS INTERRUPTION, LOSS OF BUSINESS INFORMATION, AND THE LIKE) ARISING OUT OF THE USE OF OR INABILITY TO USE THE PRODUCT EVEN IF OHG OR THE FOUNDRY HAS BEEN ADVISED OF THE POSSIBILITY OF SUCH DAMAGES.<br>Because some jurisdictions do not allow the exclusion or limitation of liability for consequential or incidental damages, the above limitation may not apply to you. 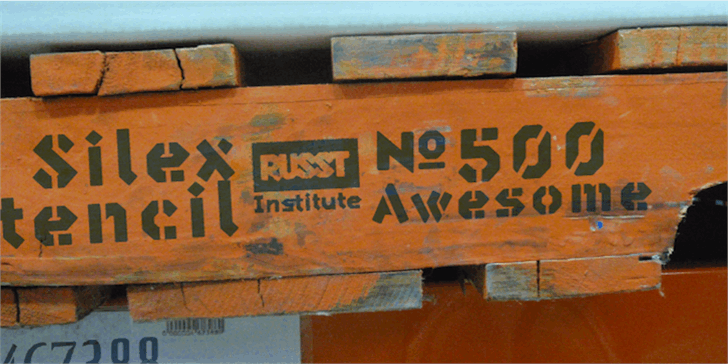 Silex Stencil BasicBlack is a trademark of Russell McGorman /Our House Graphics.